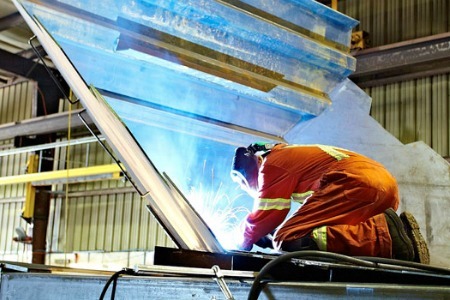 Mainland Machinery / Canada / Will Low Oil Prices Affect Metal Fabricators? The drop in oil prices hasn’t yet touched metal fabricators, but over the long term, we know that lower prices for oil and gas will lessen production, which could affect the fabrication industry. How this will look is hard to say, but it is clear that a heavy dependence on the oil and gas sector could slow down demand for some businesses. It may seem counter-intuitive, but dropping oil prices could end up being good for manufacturers and fabricators. For one thing, the Canadian dollar is heavily tied to oil prices, and as it drops, state-of-the-art manufacturing could be in greater demand. Another opportunity for metal fabrication is in ongoing projects, which continue to require replacement parts and ongoing development. A slower market for new projects will not necessarily mean less work, but reinvestment in older parts to get more ‘bang for the buck’ in the oil industry. Furthermore, there could possibly be an increase in steel imports over time, taking advantage of cheaper prices for transport and materials. It’s worth noting that just as the strengthening Canadian dollar led to layoffs in the manufacturing sector in 2004, the reverse could happen today as the dollar drops. As layoffs occur in the oil field, manufacturers are bracing for a downturn in the fabrication sector as well. But fabrication works on a different time scale than the oil field, and changes are slower to reach the sector. Because of the time needed to produce metal pieces for the oil field, companies are working on projects now for deliverables that are months down the line. Predicting production needs over the longer term is difficult, but ongoing projects still need to be produced. Prices for hot rolled coil are down, as is demand for sheet steel and bars for seamless pipe. Steel is faring better than other metals, like copper and aluminum, which have seen great changes in commodity prices since the oil bubble burst. Over the long term, the down turn could be damaging, especially for fabricators whose most significant markets are in Western Canada, Texas, or North Dakota. Some US oil and gas producers believe steel demand from the oil sector could be down by as much as 50% in the next year, and that spells trouble for businesses that haven’t diversified. Like the Canadian dollar, being tied to just one market could prove damaging for some businesses. For metal fabricators who have the ability to diversify their markets and interests, now is the time to explore a greater variety of business partners, thus mitigating the negative impact of low oil prices. One recommendation is to pursue or further existing relationships with automakers, as they make the most value-added steel. Overall, the industry outlook is positive. While this could be a challenging time for some metal fabricators, it isn’t likely to cause serious harm to the industry as a whole.